LS Music caters for a wide range of live music entertainment requirements. Italian guitarist, DJ and multi-instrumentalist, Luca plays acoustic and electric guitars as well as ukulele. Luca can perform from soloist to full band. An All-In-One DJ and live music package is also available. As soloist Luca specializes in finger-style guitar (and ukulele) where he simultaneously plays, rhythm, bass lines, harmony and melody. Guitar and/or Accordion, or Violin, or Harp, or Saxophone, or Bass, or Percussions or let us know your preferences! Please visit my Vimeo.com/lsmusic for more sample clips and different options. Bravo, Luca, it was a beautiful evening! All alone, talented Luca provided entertainment for over a hundred people during my mother's 85 birthday party. He arrived early, was very professional and accommodating! We highly recommend this wonderful young musician and will be hiring him again! Luca is great. He is a fantastic guitarist and very friendly. He is willing to be as flexible as requested in order to meet the needs of your special occasion. He arrived early and was willing to stay around along as needed if our party went longer than expected. 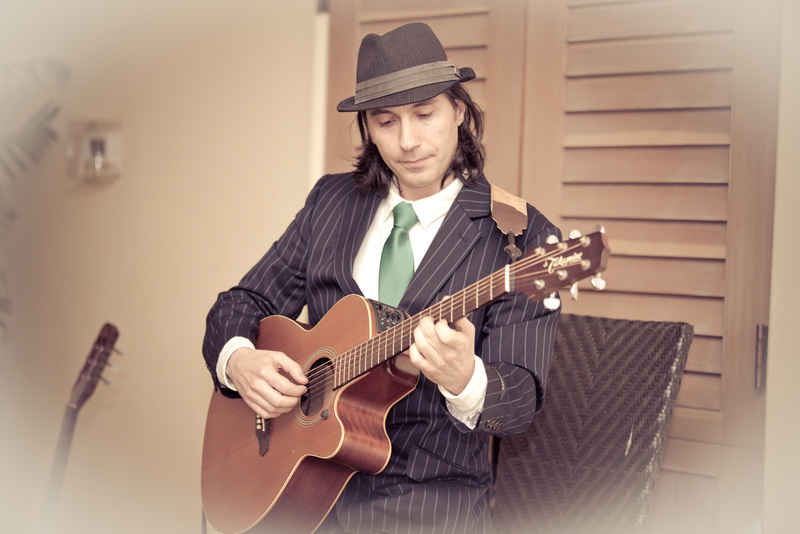 I highly recommend Luca for any type of event that needs an acoustic soloist. Talk about delivering from start to finish...Luca was incredible to work with and a great addition to my party. Looking forward to working with him again. Luca is an incredible talent! He eased right into our retirement community setting with his Italian-themed selections to fit our Brookdale Celebrates Italy. Our residents can be very outspoken and critical of entertainers and we will hear about it. Luca got rave reviews from our residents! We will definitely have him back again! Thanks, Luca!! Luca was perfect for our big family party! We had a cocktail attire dinner event with 115 guests. His music was beautiful and all the guests gave compliments. Highly, highly, highly recommend! Luca Sirianni, the guitarist , was excellent! Luca Sirianni, the guitarist, played "oldies" from the 30s to the 60s for background music at an 80th birthday luncheon. He was prepared, professional, helpful, and contributed greatly to the party. I highly recommend him and have passed his name along to my friends. Luca and his wonderful violinist played my surprise proposal and created the most wonderful, magical, perfect experience I could ever have imagined. He is a kind and talented musician with that special touch and romantic accent. His attitude and professionalism is matched by his playing ability. If your event needs a romantic mood he is the perfect performer! Professional and friendly, Luca is an awesome musician. He learned several Christmas songs for our Holiday party, filling our house with warmth and joy. Luca (LS Music) was fantastic. We had a birthday party for my husband at our home for 50 friends. We wanted someone who could play background guitar music, and add some atmosphere. Everyone kept coming up to us all night long and saying how great the guitarist was. Luca was friendly and warm, never intrusive, and so exceptionally talented. He took requests and knew any song you could possibly want to hear. Several friends took his card saying they wanted to use him for some event. You will be in good hands with Luca. We would hire him again in a second! Luca was great to work with, we would love to have him back again! He can for a resident event and all the residents complimented our live music and asked if we would have him back again. Thanks Luca! Luca entertained over a hundred people for an event at PayPal and "made" the party . Not only was his music beautiful, he's professional, friendly, and made sure everyone enjoyed the afternoon. We'll definitely hire Luca again! Luca was a wonderful part of my 40th birthday cocktail party! I contacted a couple of musicians before Luca to play at my party with a very special request: playing from my Tree House! He was the only one down for the challenge and it was JUST perfect! Our guests were delighted by his music and he went the extra mile and stayed until the end. His repertoire was extraordinary and working with him was as easy as his personality! Arrived way before the party started and had everything ready by the time the first guest (me) arrived to the party! We just loved his music and presence! Grazie Luca! Perfect addition to our event! We had a small, informal corporate event in San Francisco where we wanted some live music to enhance the atmosphere without being overbearing. LS Music was the perfect fit for our event. He was very attentive to our wishes, timely, responsive, professional, and most importantly, a fantastic musician. Everyone commented on how much they liked the music and enjoyed Luca's guitar playing. The music he played was relaxing and beautiful and perfectly suited for any social event - as Luca can adapt to the environment very easily. I highly recommend using LS Music for your social or corporate event. Luca was awesome showed up early and stayed late.. Used him for a charity event for kids with cancer (Courageous Kids). He was very professional, punctual, and exceeded all my expectations would use him again . We hire Luca for a birthday party with about 45 friends. He was great -- on time, professional, and fun. His music is terrific and varied. When some kids came to the door caroling, he adapted quickly. Would hire him again in a minute. I recently had my wedding in Carmel Valley and Luca played the guitar for my wedding ceremony and cocktail hour and I couldn't have been happier with him! He learned how to play custom songs beautifully to make our ceremony feel even more special, took song requests from the guests -- very professional and friendly! My whole family and the guests complimented his style and we will definitely be recommending Luca to those who are planning to host events where they want live music! Luca is amazing! We hired him for a gallery benefit and we were blown away by his talent and professionalism. He is a very skilled guitarist with an unbelievable play list including Rock, Pop, Jazz, World, Latin, Blues and more! We received many compliments on the music for our benefit. Luca has a great spirit and was awesome….. we would definitely hire him for future events and you should too! Luca and two other musicians played at my recent party. They were perfect. They would have played requests, but the guests were socializing most of the evening. The music was beautiful background for the party. Not too loud, and provided a beautiful mood. Excellent addition to our wedding! Luca was incredibly professional, patient, helpful, and a fantastic musician. His instrumental music provided an excellent backdrop for our outdoor summer wedding, and Luca did a great job turning quasi-DJ when we had an impromptu dance party around the picnic tables. We strongly recommend Luca for any event you're thinking of hosting, and would work with him again in a heartbeat. I had a few different artists that responded to my inquiry regarding an acoustic guitarist for our wedding at City Hall, SF. We chose Luca because he had the widest variety of songs that he knew how to play, most flexibility in our music genre, was willing to learn a new song per my request, was honest about how certain songs sound in a large dome building and being acoustic (not with a band), and was always very prompt in his correspondence. I couldn't be happier with how Luca performed on our wedding day. He was even one step ahead of me (a type A bride) in contacting me a month, a week, and a couple days before the wedding to make sure we were on the same page and plans were still the same. His performance was exactly what we imagined it would be- made for a cheerful celebration, encouraged socializing, and no dull moments of silence. He was professional, reliable, accommodating, and most of all- a wonderfully TALENTED musician!!! When booking artists, professionalism is very important, along with musically talent- both things that could make or break your event. We couldn't be happier we chose Luca to perform at our wedding. Thank you so much!!!! Professional, Dedicated, Talented, Kind and Reliable! I can't say enough about how Luca handled our event from the very first email. Prompt response and willingness to do whatever it took to provide the music we were looking for. I never doubted that when he and his violinist showed up to the event (well before the start) that we would be thrilled and so pleased with the performance. Luca met all of our needs so professionally and with great compassion. He is such a nice and true gentleman. Would use him again without a doubt. We booked Luca for our work anniversary party. He was so professional throughout the entire process. He is right on top of things as far as contact and follow up. I was very pleased with not only his work ethic, but his playing far exceeded my expectations. He is so talented and everyone was gushing about the music he provided at the party and afterwards. He is also very attractive and offers a list of different attire he has available to wear! I highly recommend booking him for your event. Luca is such a talented and professional musician. You can't go wrong booking him for a gig. We had him play for 2 different events and will be sure to book him for our next event as well. He is charming and is so agreeable to playing requests. His specialty is jazz guitar and he has a great style to all of his compositions. 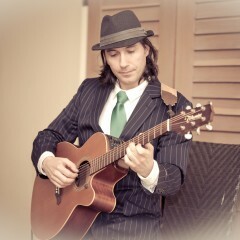 We contacted Luca to play for my parents' 25th wedding anniversary party which was vintage Brazilian themed since they traveled there on their honeymoon. The three piece ensemble arrived on time, and set up was quick and painless. They were accommodating of all song requests and ensured all the other special details were planned well in advanced. Luca is prompt with all email inquiries, honest and genuinely cares about delivering the best experience possible. I am no bossa nova authority, but the musical selection sounded great for our quaint backyard setting. Would certainly recommend them for anyone planning a similarly themed party. Thanks Luca! My company had the pleasure of having Luca perform at our holiday party, and we couldn't have been more impressed with the ambiance he provided the entire night. Luca has an amazing assortment of genre's in which to choose from, as well as taking requests made by the employee's. Luca will definitely impress on every level. Luca went above and beyond my expectations. Luca was a key player in making our Christmas party a day to remember. His selection of music was perfect for our mixed crowd of children and adults. I look forward to booking him again next year. I would recommend him to anyone. Luca was professional and thorough even before he arrived. He made sure to confirm his engagement and review the typ of music that we wanted. He was punctual, organized and dressed appropriately for our event. We plan on inviting Luca to future events and I highly recommend him. I hosted a surprise b-day party for my husband. Luca showed up two hours early to set up. He added some classical music to his repertoire that I requested for him to play. The music was wonderful. Everybody loved his playing. He is a wonderful, sweet person and very easy to work with. My wife planned a surprise birthday celebration for me that included live music from a guitarist playing instrumental favorite songs of mine. The gentleman's name was Luca and the sound of his solo guitar provided the most incredible ambient soundtrack for a gathering of some of my closest, dearest friends. Luca's musicianship has a soothing, sublime effect on the spirit that reflects both his technical prowess and his creative interpretations of classic songs. Once in a long while you find yourself listening to someone playing live music and are mesmerized by the fullness of the sound and sweetness of the emotion evoked directly from their artist's soul, the complimentary frequencies of which resonate with that deepest part of ourselves that seek tranquility. Luca is such an artist who's warm personality transcends each note, giving pure joy to those lucky enough to be his audience! A great artist for many occasions! Luca is a great artist for many different occasions! He played for our Wedding Show we hosted last week and added to the elegant ambiance of the event. In addition, he is able to customize his playlist and add other musicians to create exactly what you are looking for. He is extremely personable and we are pleased to have him on our preferred vendor list. Couldn't be happier with Luca! I sought out musicians to play a wedding celebration at the very last minute, and was lucky to find Luca here. He was highly professional, particularly in his communications. He was fair, honest, set expectations, and over-delivered! He played 2 sets solo during cocktails and dinner - great! Then he brought in a four piece band to play the party afterwards - fantastic! I'd hire him for another event without hesitation! Satisfaction guaranteed! Professional, punctual, accommodating, talented, and fantastic! I could go on and on. We loved him. Our guests loved him. He was taking requests from them which delighted them to no end! Luca plays so beautifully. His talent and creativity is right up there with the best. We will ask him over and over again to play for us at whatever event we have going on. Thank you Luca for a memorable experience. There is nothing like when you hear magic in music - it’s contagious! Luca, many thanks to you as you provided nothing less then a magical musical hour when performing at our corporate event. Look forward to having you back. Great Music! ... Great Performance! ... Great Time! We hired Luca for our civil wedding at a winery in Sonoma, CA. He was definitely one of the highlights of the day. During our cocktail hour and the ceremony, he entertained guests with great music! His solo guitar is pretty awesome! Luca does not only offer a fix set of songs ... if you provide any song with enough anticipation ... Luca will make sure he learn the song before your special day. I also noticed how multiple guests approached to Luca and he was super nice to them. He was even taking song requests from guests. I am sure they had a amazing time. After the wedding, we got lots of compliments from our guests and one of the things that they kept pointing out was how cool was to have Luca at the wedding. 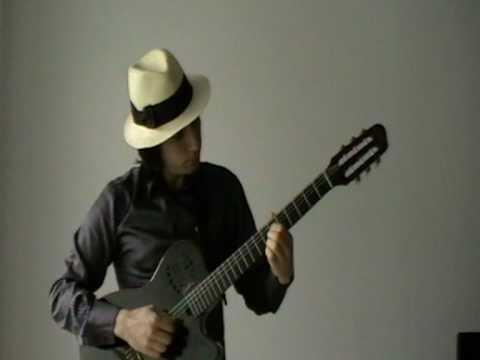 If you are looking for a solo guitar for any special occasion ... Luca is the one! I hired Luca for my mom's 50th birthday party and to say the least, he was a total hit. He was very responsive and receptive to my specific requests. Plus, his music selections were right on target. The addition of his musical stylings really added to the ambiance and the party was a complete SUCCESS. I would recommend Luca without a glimmer of a doubt. I hired luca to play at our wedding in July. Pre-wedding, ceremony, and cocktail hour. We had asked him to learn a few new songs for us. Song 1"Come away with me " and Song 2 "Making memories of us. " We didn't actually meet until the rehearsal day ( I highly suggest you have your live musician there on that day. It minimizes any confusion the following day). I was nervous at first, but as soon as luca started playing, I was THRILLED. It was the perfect sound and he nailed the songs we asked him to learn. Luca was responsive, but sometimes i had a little bit of difficulty making sure we were on the same page. If at first you can't understand him, be a little patient. He's totally worth it. We had an informal wedding reception nestled in the woods and we wanted to have some background music that everyone would enjoy. (Plus the park didn't allow loud amplified music). We like more soft jazz, R&B and the classics. I hadn't booked Luca before but took a risk because I fell in love with his music samples online. His repertoire was just what we were looking for. Additionally, Luca was very responsive throughout the process and he made sure he understood what we were looking for. I have to tell you that we loved Luca and our guests enjoyed his music a lot. People actually gathered around him to listen closer and they kept asking me where I found him! Luca is a very talented guitarist and his warm and friendly personality was a PLUS! Luca can play solo or he can play in a duo, trio or more. We chose a duo; I requested for a keyboard player, but since one was not available, an accordionist accompanied him. I thought it was an odd combo; it's not what I expected at all but it turned out very nicely! At the end, Luca hang out with the guests and took requests; that was very nice of him. I think he's under rated. He's truly one of the best guitar players I've ever heard. If you have any doubts, please just listen to his music on his website. Thank you, Luca, for making our event even more memorable. Luca performed for a dinner at Bouchaine Vineyards this spring. His music was perfect-ptich for our event - engaging, inviting, and perfect when we needed background music or more uptempo for dancing. Would highly recommend him! Luca is an amazing musician! Luca was great. He was incredibly flexible and easy to work with. He showed up well on time and He was professional in all aspects of his work. He's an amazing guitarist. The music was perfect for our event, upbeat, energetic and romantic. I highly recommend him. We highly recommend LS Music! After reviewing many music providers, we ultimately selected LS Music and trusted Luca to be the sole entertainment provider. He played background music during our ceremony and our cocktail reception, finishing the evening with up tempo dancing music. Many of our guests were so impressed with his playing, Luca also played lots of song requests outside his usual repertoire. He was extremely kind, understanding, and easy to work with. Thank you Luca! You were incredible! Fingerstyle guitar for a wedding ceremony or cocktail hours. Duet and trio combinations are available with violinist, saxophonist, pianist, percussionist, clarinettist, accordionist or singer. Solo guitar for the ceremony, duet/trio for the cocktail hours, DJ (or dance band) to end the day. A full 250 songs multi genre repertoire can be downloaded from the web site. Luca’s own musical journey began in southern Italy in a small town of the Calabria region, he moved to Florence in his teens, and later to London where he lived for several years before relocating to San Francisco in 2011 with his wife. He started playing the guitar at the age of 11 when his older sister bequeathed him the instrument, a book of chords and knowledge of the “C” turnaround. Within days, he had taught himself to play and hours of practice and dedication followed. Over the years Luca has collaborated with several artists through his travels, developing a solid level of musicianship in multiple genres and building up an international repertoire. He plays a variety of easy listening songs, and multi-genre repertoire aimed to appeal to all ages and musical taste. Please visit my Vimeo page (LS Music) for more sample clips. How far do you travel and what is the travel fee? We would travel anywhere that is safe and reasonable traveling to. For local travel we commonly consider the fair cost of gasoline, tolls and other costs like parking. For long distances, uneasy routes like up hill bendy mountain roads and heavily congested roads, we ask a reasonable rate of all costs and travel time involved. If any restricted access is in place at the venue, we require a loading/unloading permit. For driving distance further then 100 miles, and events ending after 11:45pm, an overnight accommodation would be commonly required, depending on the event location. Secured/controlled parking facilities are required for all artists/crew members vehicles. All power supply within reasonable reach from the stage. A separate 20amp circuit may be needed for some type of light installations. Protection from rain, sun or wind.